June 12, 2018 By Allyson 5 Comments This post may contain affiliate links. Read my disclosure policy. 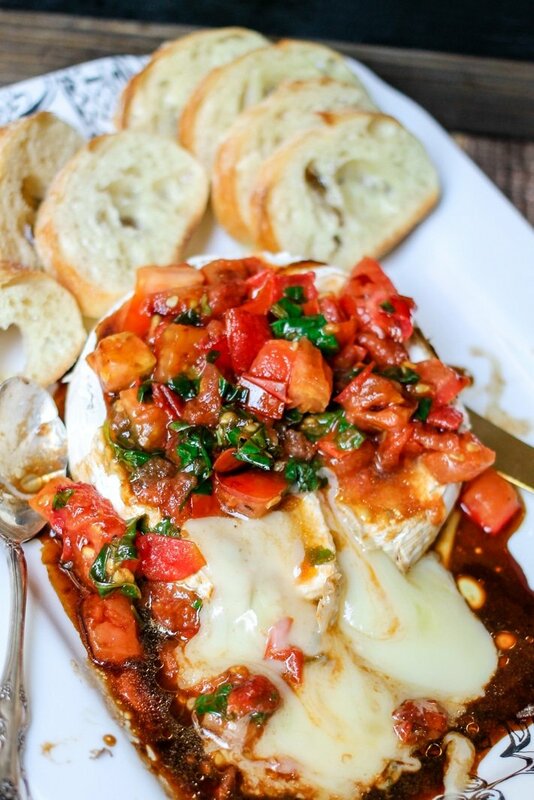 Fresh tomatoes and basil loaded on top of delicious gooey brie will make this Bruschetta Baked Brie your favorite go-to easy party appetizer! Baked brie is a staple when it comes to party appetizers. It’s very easy to make, super flavorful, and looks stunning. Using fresh tomatoes and basil is great for the topping, and it pairs perfectly with the mild brie cheese flavor. Baked brie is a wheel of mild soft cheese that is baked. Once baked the center melts, however the edible rind keeps the cheese from pouring out. Once sliced into, expect the melted cheese to come pouring out, turning into an easy t dip into cheese. While bruschetta baked brie is delicious, there are lots of other options for topping baked brie as well. Using something as simple as honey and walnuts is great, or going a little bit more elaborate with cranberries (Cranberry Baked Brie) is another great option. It’s EASY to make baked brie! This Bruschetta baked brie comes together in 5 minutes and then all you need to do is bake it. Combine all the toppings in a bowl, place it in the fridge. Bake the brie cheese then add the bruschetta topping, and serve immediately. 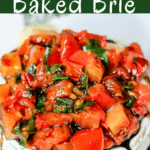 Fresh tomatoes, fresh basil, garlic, olive oil, balsamic vinegar, and salt are the ingredients you need for the bruschetta baked brie topping. Add them to a small bowl, stir to combine, then refrigerate until ready to use. This is a basic bruschetta recipe that you can use for anything (great on top of chicken, too!). Baked brie in puff pastry is a popular alternative to baked brie. You can make Bruschetta Baked brie using a puff pastry shell as well. Slice the top of the rind off the cheese wheel. Lay out a defrosted puff pasty sheet flat, and rolled out a bit. Place your cheese on top of puff pastry sheet. Add the bruschetta topping to the top of the cheese, and stretch the puff pastry to cover the brie. Use an egg wash (egg+water beaten), and brush over the entire puff pastry once sealed. Bake for 25 minutes at 425 degrees. Serve immediately – will be hot! Girls night? Whether at your house or a friends, this bruschetta baked brie is the perfect appetizer to pass around. Your friends will LOVE it! Summer BBQ! Grilling out? Great! Make this Bruschetta Baked Brie ahead of time (just don’t bake until you need it), and then pop it in the oven when your guests start arriving! 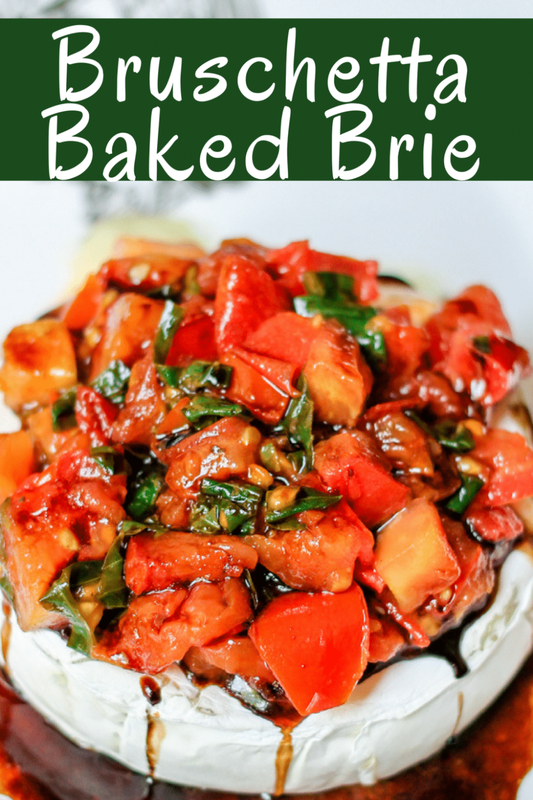 A holiday party would be a great time to serve this Bruschetta Baked Brie! Just make sure you have a bake up because it will disappear in a jiffy! At home Date-night with your significant other? Plan to make this easy appetizer and WOW them with some champagne alongside the cheese! If you like Bruschetta as much as I do, you need to try these other recipes! Skinny Bruschetta grilled chicken is juicy, delicious, simple to make, and super healthy! BLT Bruschetta is a bacon lovers dream appetizer! Bruschetta Chicken Pasta is a pasta lovers perfect meal! Filled with tender chicken, fresh tomatoes, and a secret sauce you will never imagine! Fresh tomatoes and basil loaded on top of a delicious wheel of gooey brie makes the perfect appetizer. 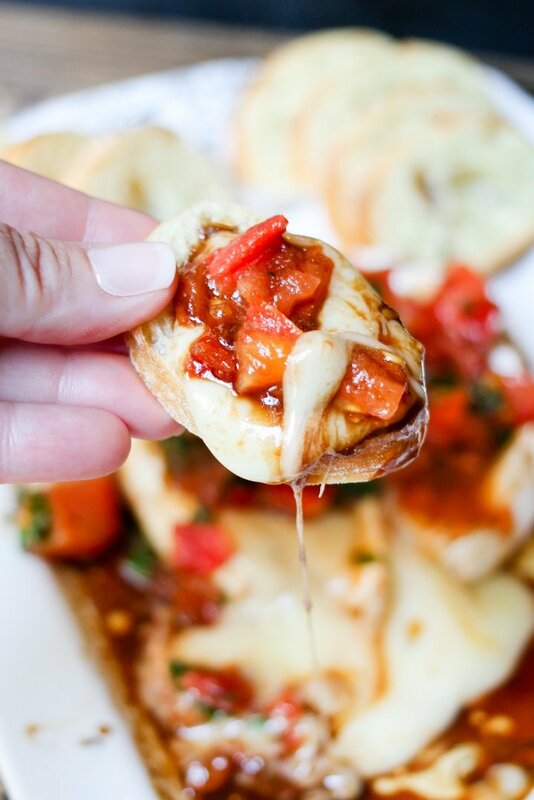 This Bruschetta Baked Brie will be your favorite go-to easy party dish! In a medium bowl add tomatoes, basil, garlic, olive oil, vinegar, and salt. Stir to combine. Place in fridge until ready to use. Oil an oven safe baking dish. Unwrap brie wheel and place on top of dish, in the center. Place into oven and cook for 15 minutes. Carefully remove, dish will be hot. Allow to cool for 5 minutes. Using a slotted spoon, scoop the bruschetta topping onto the center of the brie. Spread over the top. Serve immediately with scoopers such as a sliced toasted baguette, crackers, or veggies! *Nutritional content does not include garnishes such as baguette or crackers. This would go fast with my family! Saving! I was working in my garden today, and dreaming of ways I can use these tomatoes. THIS! This sounds perfect. I love cheesy appetizers as a party starter! Pinned! WOW!! This looks and sounds faaantastic!! I can’t wait to try it!! It looks and sounds amazing!! Can’t wait to try it!